In a time filled with endless movie and television interpretations of Charles Dickens’ A Christmas Carol, it is easy to get confused about what the actual story says or does not say. I love all the variations, whether it be my favorite version with Alistair Sim, or Bill Murray in Scrooged, or Kermit the Frog clerking for George C. Scott. Some stay closer to the story than others, but all seek to portray the same message that Dickens created — the choice of joy in the world. The plot line is undoubtedly familiar to most, but the written story itself is still refreshing to revisit. Yes, it as wordy as Dickens always is, but there is an excitement behind the writing which supports the theme of joy itself. Dickens seems as if he is sitting in the room telling you this story, hardly able to remain seated as he describes the feast surrounding the Ghost of Christmas Present, or the horror of the voiceless Ghost of Christmas Yet to Come. It is not a continually cheerful story — it is a ghost story; yet the greatest horrors come in Dickens’ paintings of the people suffering from want of food, shelter, or love. Scrooge is not excused from what he has created, and thus his conversion will either be dramatic or fail to occur. Of course, he is converted. It is easy to put a Christian gloss on a Christmas story, but this is not a story of Christian redemption. Scrooge does go to church on Christmas day, but that is noted in passing. Instead, we get a longer description of him pacing in front of this nephew’s door working up the courage to enter. We are also privy to what is often described as a comic moment in the films, in which he meets up with one of the people who sought his assistance the day before in helping the poor. In this horrific scene Scrooge confirms that the prisons and Union workhouses are still in operation, but is told people would rather die than go there. “‘If they would rather die,’ said Scrooge, ‘they had better do it, and decrease the surplus population.” Who, then, should the reformed Scrooge meet as soon as he walks out the door on Christmas day, than one of these men. “It set a pang across his heart to think how this old gentleman would look upon him when they met; but he knew what path lay straight before him, and he took it.” In other words, the challenge of overcoming his past is directly presented to him, and he chooses to go straight after it. Scrooge changes because he realizes he has a choice in how to live his life, and so far he has chosen poorly. He can withdraw from the world and its demands, but be miserable, or he can embrace life and those around him. We know his choice and we see the impact it has on others. Like George Bailey, from another memorable Christmas movie, he also sees the impact his life has on others. We are here, we impact others, and we choose our path in life. Simple, but essential, lessons. 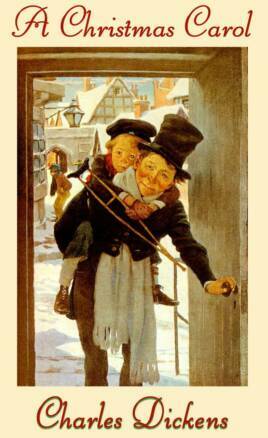 This entry was posted in Classics, Novel and tagged a christmas carol, charles dickens by derekemerson. Bookmark the permalink.